Decorative floor coatings installed at excellent prices. 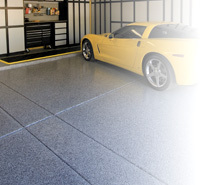 Polyaspartic garage floor coatings make an excellent addition to any garage, kitchen, patio, deck, or room in your house. Our coatings are superior in strength, durablitiy, cleanability, and look fabulous! We also offer pavers, sealers, cleaners, degreasers, and anti-slip coatings for whatever your need or want may be. Choose or customize a garage floor with chips, fleck, flake, etc... If your looking to customize the man-cave then you've come to the right place, we offer cabinets, storage, and more! Click here to see our product directory/info, click here to see our sitemap. Now serving the following and surrounding areas: Pennsylvania, Delaware, Philly, Pennsylvania, Dover, Trenton, Brick, Norristown, Reading, Allentown, Bethlehem, Plainfield, Edison, Millville, Middle, Atlantic City, Salisbury, Ocean Pines, Berlin, Newark, Wilmington, Lancaster, York, Scranton. To see if we install in your area contact us!